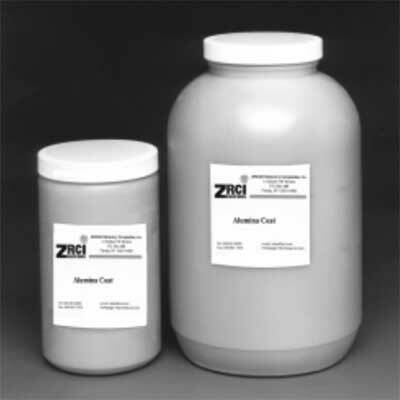 Alumina Coat | ZIRCAR Refractory Composites, Inc.
ZRCI ALUMINA COAT is an all-alumina liquid formulation used for hardening and increasing the refractoriness of the surfaces of alumina and alumina-silicate fiber products. ZRCI ALUMINA COAT is composed of high purity aluminum oxide in a water base. Hardening of the surfaces of blanket and felt insulation improves the resistance to erosion by high velocity gases and reduces the permeability of gases. The tendency of flame burn-through of low density ceramic fiber insulation in many cases can be prevented by a coating of ZRCI ALUMINA COAT . Ceramic papers, including alumina and alumina-silica paper can be rigidized with the liquid. Strong laminated tubes or complex shapes can be built up from saturated paper. Treated materials are ready for use as soon as they become dry. The liquid is easily applied by brushing, rolling, dipping, sponging or spraying. It may be diluted with water if desired. ALUMINA COAT is non-flammable and is not affected by freezing. When applying with spray equipment, adequate ventilation and precautions against inhalation of particles should be provided. After the physical water has been removed by normal evaporation or by heating, a bond forms that stiffens the fibrous material. Coverage will depend on the degree of hardening desired. One gallon covers 100 ft2 if sprayed as a thin coating about 1/16″ thick. * May be limited by the use temperature of ceramic fiber treated. ALUMINA COAT is used as a surface hardening and strengthening agent for low density alumina and alumina-silica ceramic fiber paper, blanket and board insulation. ALUMINA COAT is used as a bonding agent in the manufacture of “All-Alumina” high temperature composites and laminates. ALUMINA COAT is used to stop flame and hot high velocity gas erosion of furnace linings.